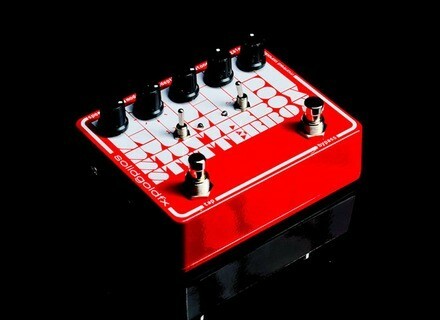 Stutterbox 2, Tremolo pedal from SolidGoldFX. 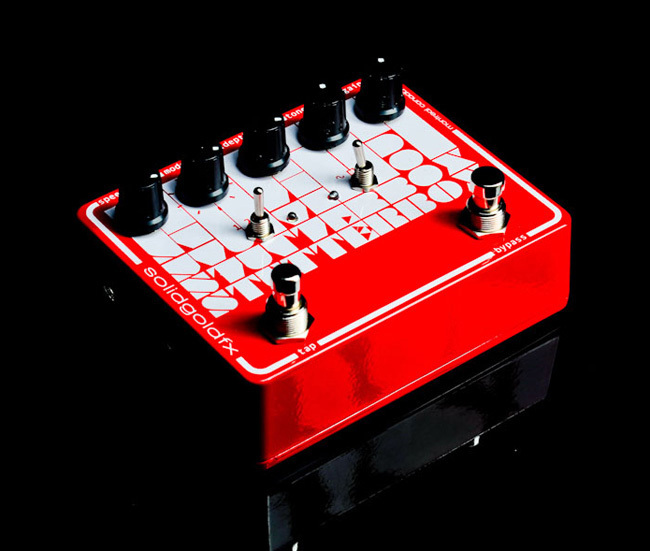 SolidGoldFX announces the release of their new Stutterbox optical tremolo pedal. The Stutterbox is a design combining an analog tremolo relying on a light source and photocell to create its throbbing effect reminiscent of vintage tube amps, with a tap tempo controller. Multiple speed controls, various waveforms, rhythmic modes and an adjustable output section are included. The Stutterbox is equipped with SGFX’s tap tempo microprocessor. As such, the tremolo rate can be set using the speed knob, controlled by expression pedal, or tapped in via the tap foot-switch. The pedal also features a tap multiplier with 1x, 2x, and 4x multiplier settings. Three distinct waveform settings, including sine, square, and sweep settings, along with eight different rhythmic patterns and accents via the Mode knob. The sine and square wave settings deliver both soft and hard tremolo tones while the sweep setting delivers a choppy yet rounded effect much like you would expect from a tube driven trem, according to the company. Finally, the Stutterbox is fitted with Tone and Gain controls. A standard 2.1mm 9-18vDC input jack is provided and true bypass switching are included. The Stutterbox is available for $239. Washburn WJ130EK Washburn Guitars introduces the WJ130EK jumbo acoustic/electric guitar as part of its Vintage Series. Molten Voltage One Trick Pony Molten Voltage has released One Trick Pony, a micro MIDI pedal that steps through the Whammy settings and reverses direction when held 2 seconds. Guild GSR T-500 The Guild GSR T-500 is a limited production hollow-body electric guitar produced in Guild’s New Hartford factory.